This is my fifth Beacbody workout that I have completed. 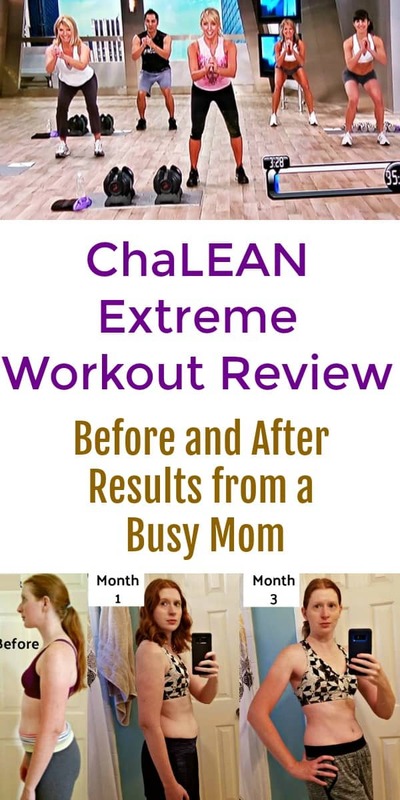 I have been thrilled with the results that I am seeing from each and every single one but the ChaLEAN Extreme workout is probably my new favorite. I have been using the Beachbody on Demand program for the past year now and it has been worth every single penny (it’s less than $9/month!). 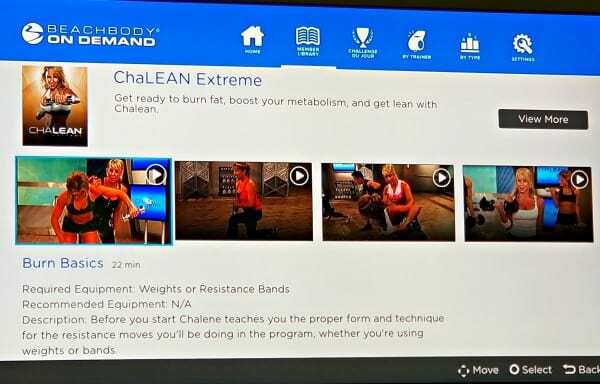 It appears that at this time you can only do the ChaLEAN Extreme workout on Beachbody on Demand as Beachbody isn’t selling the program as a physical set, you can just stream it. I think that this is actually a better option for those of you on the fence about starting this program because you can actually sign up for a 14 day free trial of Beachbody on Demand to see if you like it before committing to making a purchase. I really enjoyed this workout program and highly recommend it to anyone who is looking to increase your strength and endurance. This is an intermediate level workout but even beginners can do this, it includes a modifier so that you can make the moves easier if they are too much of a challenge. I like the fact that the modifier doesn’t do a lot of jumping but still gets a good workout. I had a do a few of the modified exercises because I have bad knees and I don’t want to risk injuring myself. What is the ChaLEAN Extreme workout program? The ChaLEAN Extreme workout is mainly a strength training program that is divided up into 3 phases over 90 days. It is taught by Chalene Johnson and the workouts last around 45 minutes on average. I love Chalene’s training style and how she motivates you without screaming and yelling at the TV. You will do a workout for 5 days a week and get 2 days off. Some days you will have to do two workouts but they are shorter so they still come out to around 45 minutes a day. So you get a good variety to build muscle and burn fat each and every week! It is so important to add strength training into your fitness routine because the more muscle you have the more fat you burn, even at rest. Muscle increases your metabolism so that you can burn more fat each and every day. You don’t have to worry about looking bulky and big, this program gives you a lean and sleek looking body. To do this program, you will need some type of resistance. You can use a set of light, medium, and heavy dumbbells or a resistance band. They will show you how to use both for each and every workout. I personally used the dumbbells. I started with 5, 8, and 10 lbs. You may need to invest in more weights as you get stronger so that you can see the maximum results. I ended up purchasing a 15 lb. set later in phase 2 of the program. Chalene uses the Bowflex Select Tech weights that you can dial up to 52.5lbs. I really wish I had these but they are really expensive. If you are going to stick with this program for a long time, it may be worth the investment but that is up to you. They also use a resistance loop for your thighs but that is optional. I didn’t use one and still saw good results. You may also want to get a workout mat if you will be doing this on hard floors. The ChaLEAN Extreme program comes with a workout calandar so you can know which workouts to do when, a tracking workbook to keep up with the amount of weight you are using, and a nutrition plan so that you can maximize your results. I was incredibly happy with the results that I saw from doing this workout program! I can see my abs now! Not to mention that my muscles in my arms and legs are much more defined and I can tell a huge difference in my strength and endurance from when I first started this workout. I honestly couldn’t do a push up without being on my knees and now I can do a proper push up and even go right into a side plank! I didn’t have a ton of weight to lose when I first started the program, I mainly wanted to tone up and gain muscle. You can tell that I actually gained weight during the last month but that is because that is the month that you start lifting the heaviest weights that you can so I actually lost fat but gained muscle ( muscle weighs more than fat). I really enjoyed this program and realizing just how strong I am. I was amazed how more defined my arms and shoulders are and that I can actually see abs on my stomach! I am actually looking forward to going swimsuit shopping this season….I never thought I would say that! 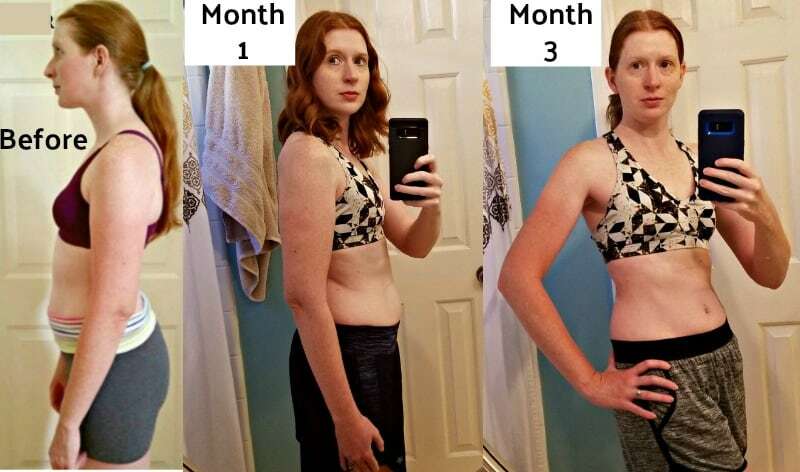 These are my before and after photos from the beginning of the program all the way through month 3. I wish I was a bit tanner so that you could see the definition better, but that is the frustration with being pale. Also, please excuse the farmer’s tan I have going on in month 3….I forgot to put on sunscreen when we went to the fair :). 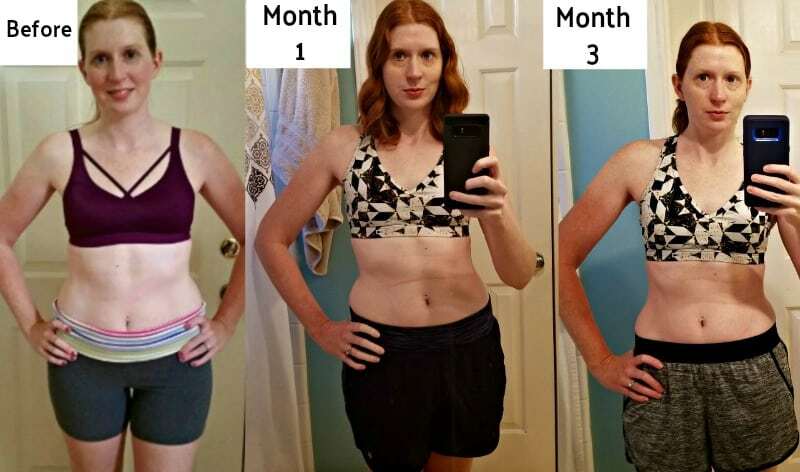 The ChaLEAN Extreme workout was very easy to stick to because I was seeing results each and every month. I loved the fact that with each workout, the most you had to do was 10 reps.
As long as you are making it to 10, you know that you are lifting heavy enough. With this workout, you do slow and controlled reps so that you don’t have to do 30-50 to start seeing results. This is a workout that everyone can do. 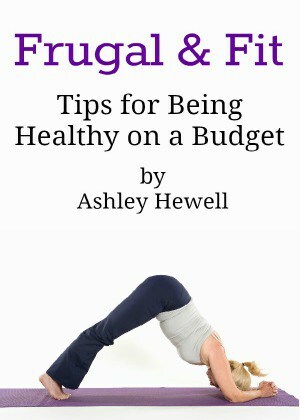 Just use lighter weights and use the modified workouts if you are just starting out. You will be amazed at how strong you will become. 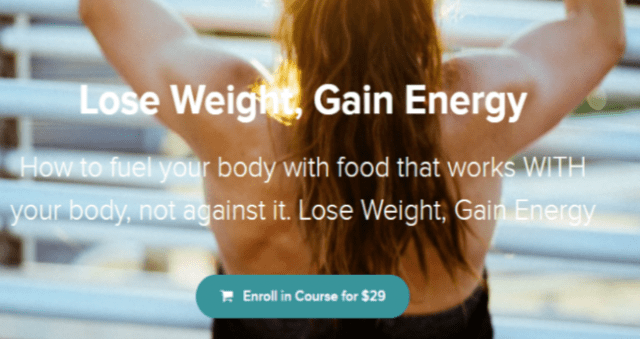 I hope this ChaLEAN Extreme review has given you a little more info about the program and will help you decide to take the step to improve your health and fitness. I am so pumped to start my next Beachbody workout, 80 Day Obsession, to take my fitness to the next level. I will have a full review written on that next time. So glad you posted this! I’m getting ready to start ChaLEAN Extreme for the 2nd time. I like her workout style and the pace/length of these workouts.